Laser Eye Surgery For Keratoconus: Can It Be Used To Improve The Condition? Are you suffering from keratoconus? You may be wondering if laser eye surgery for you to correct that worsening vision. 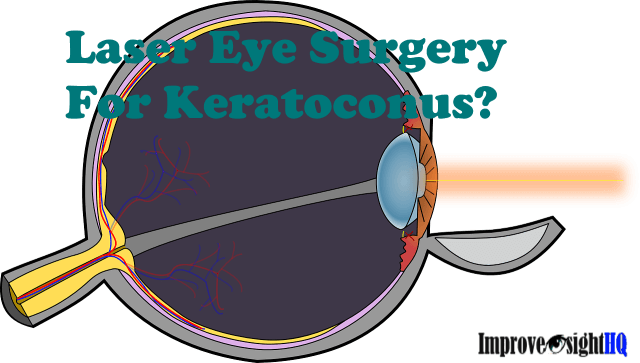 Here is what I found out about laser eye surgery for keratoconus. According to Harvard Medical School, keratoconus is an eye disorder where there is progressive thinning of the cornea (the clear tissue that covers the front of the eye). This results from abnormality in collagen production. 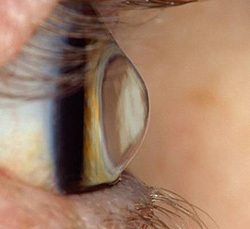 The middle of the cornea becomes thinner, and will eventually bulge outward, resulting in a cornea shape. The changes in the curvature of the cornea affects its refractive power, which will lead to astigmatism (distortion of vision), myopia (blurriness of vision) and/or increased sensitivity to light. Other issues include swelling and scarring of the eye tissue that may impair vision. Are you wondering if you have keratoconus? Keratoconus is the most common corneal dystrophy disorder in the United States, and typically has an early onset - more prevalent in teenagers and young adults. One of the earliest symptoms of keratoconus is the slight blurring of vision that cannot be easily corrected with glasses. Here is a simple checklist of possible symptoms that indicate you may have keratoconus. Have systemic disorders like Down Syndrome, Ehlers-Danlos syndrome, etc. “We see this condition in families, especially in the Middle East where cousins sometimes marry cousins.” - Dr Walter J. Stark, professor of ophthalmology and director of cornea and refractive surgery at Albany Medical College, New York. To be sure if you have keratoconus, your ophthalmologist will need to measure the shape of your cornea. If already at a later stage of the disease, a slit-lamp exam of the cornea is performed. But did you know, even with the corneal topography, diagnosis can be quite iffy in the early stages of keratoconus (also known as forme fruste keratoconus)? This is because an abnormal topography finding that seems like early keratoconus can actually be symptoms of other eye conditions such as pellucid marginal degeneration, Terrien’s degeneration or contact lens warpage (fancy term for long term usage of hard contact lens). Note: If you have keratoconus, and plan to have/or already have children, it is still best to bring them for corneal topography annually when the child reaches 10 years old. Here are a list of the common treatment options for keratoconus.. Both eyes are usually affected, with one eye having more severe problem than the other. You can correct mild nearsightedness and astigmatism with soft contact lens initially. If the condition deteriorates, these specially fitted contact lens may be prescribed to correct the cornea distortion. For most people, their cornea will become more stable after a few years with no severe vision problems. Intacs are thin plastic semi circular rings inserted into the mid layer of the cornea to flatten it to improve mild myopia. They are suitable for someone in the early to moderate stages of keratoconus, have little or no corneal scarring, but cannot wear glasses/contact lens. Aimed at arresting progression of keratoconus, the procedure treats the eye with UV light after soaking with riboflavin. The theory is to strengthen the already weakened cornea structure to prevent the cornea from going out of shape. This procedure does not cure keratoconus. There is a minority where the disorder progresses to such that scarring of the eye tissue impairs vision, or it becomes difficult to tolerate wearing contact lens. In such cases of advanced keratoconus, medical professionals may suggest cornea transplant as a viable surgical treatment option. Corneal transplants may have serious rejection issues and postoperative complications. Does Laser Eye Surgery Work For Keratoconus? You may notice that laser eye refractive surgeries are glaringly absent from the list of common treatment for keratoconus. Which are precisely conditions that laser eye surgeries like LASIK should be able to correct effectively. So why are laser eye surgeries not included as common treatment for keratoconus? The short answer is that if you have keratoconus, LASIK is basically out of the picture for you. LASIK is a well accepted contraindication for people with keratoconus. In fact, symptoms of keratoconus are possible side effects of LASIK. As for other laser eye refractive surgery procedures like PRK, the jury is still out there on whether it is medically risky for someone who have keratoconus. Not all surgeons are willing to conduct any form of laser eye surgery for patients with keratoconus. A study published in 2000 indicated that for patients with true keratoconus, most refractive surgeries tend to have poor outcomes. Some surgeons are concerned about the medical risks and potential legal implications of recommending laser eye refractive surgery for people with keratoconus, and hence would decline performing the procedure for anyone suspected of having keratoconus symptoms. However, more aggressive surgeons believe that for patients with early keratoconus, PRK may still be a viable option for vision correction. This is because the epithelial cells which are removed during the procedure can regenerate. The same study mentioned above supports the argument for PRK for people with keratoconus. It concluded that for patients who were suspected of early keratoconus and have stable refraction, PRK appeared to be a safe procedure for correcting vision problems like myopia or astigmatism. PRK may be considered if you are in the very early stages of the disorder. That being said, if you have symptoms of keratoconus, it is best that you mention to your doctor if you are very keen on pursuing laser eye surgery to correct your vision. He/she will be able to best advise you on the risks as well as potential implications involved. If you have keratoconus, have you considered laser refractive surgery? If you have, did you go for the procedure?